For the past two decades, Google has been winning the hearts of millions with its famous search engine, unique values, and perk-rich company culture. Google has released countless products, but there’s one that really stands out from the crowd — G Suite. G Suite was created to help teams seamlessly collaborate, and slowly but surely, is gaining market share. Organizations of all sizes are turning to G Suite for email management, easy collaboration functions, document hosting, and access to productivity apps, such as Google Drive, Docs, Sheets, and Calendar. G Suite’s product offering gives users a great amount of flexibility and versatility. But there is one iffy app — Google Forms. There’s technically nothing wrong with Google Forms; they’re just a little basic for organizations’ information collection needs. That’s why many businesses choose JotForm as the best Google Forms alternative. The beauty of using JotForm is that users can take advantage of its power while still doing business as usual in G Suite. Users can easily integrate G Suite apps directly into their forms, which automatically sends submissions into the G Suite app of their choice. What could be a better setup than that? Read on to learn how your organization can sync Google integrations with your forms. 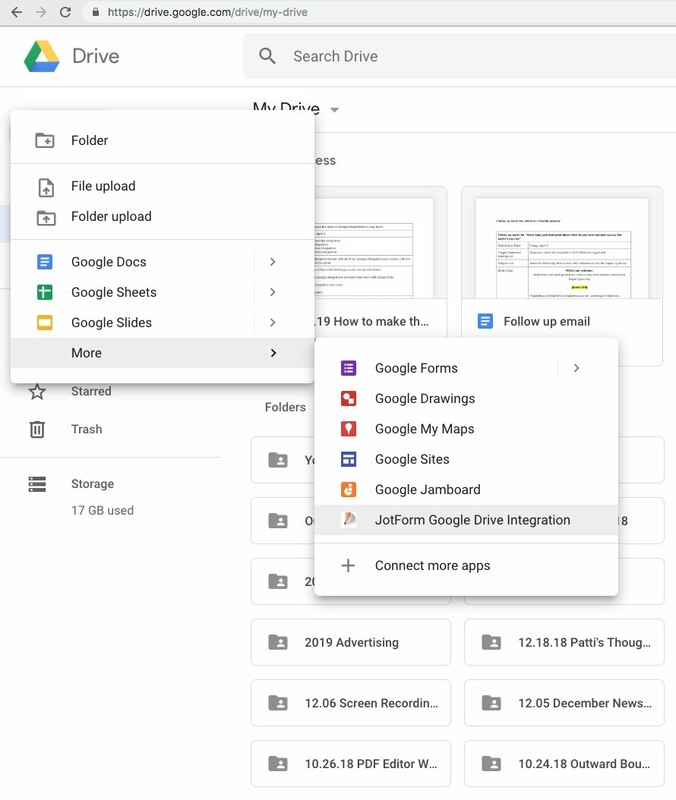 With Google Drive, teams can store all of their important files, such as Docs, Sheets, Slides, and more, in one place.  This makes it easy for project collaboration and encourages transparency between teammates. 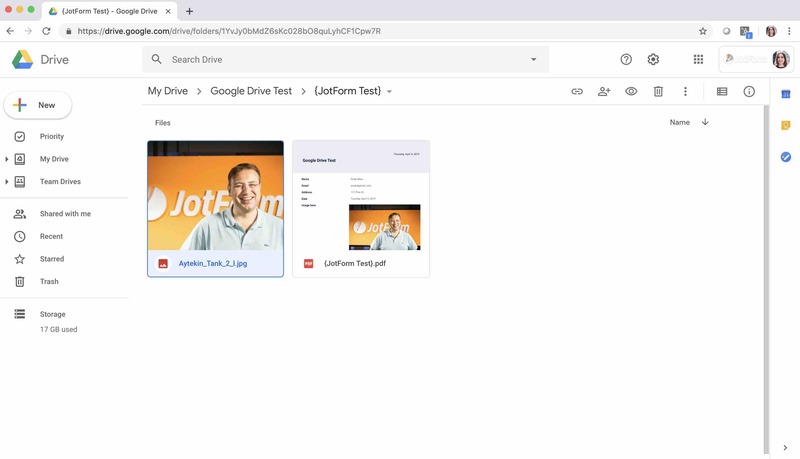 JotForm is a huge proponent of Google Drive — we store all of our company’s information in Drive, which makes it easy for us to communicate with our teammates across the globe and allows us to access our work from any place with an internet connection. We love this integration because when you sync Google Drive with your forms, all submission data automatically populates into your Drive folder, so there’s no extra work on your end. A common use case for this integration is an organization that collects submissions with upload fields. Once a respondent submits the form, all of the data in their submission and their upload files will be funneled into a Google Drive folder. No, this isn’t a typo — we have another Google Drive integration! This one’s a little different, though. It gives users a shortcut to their JotForm account via G Suite and allows them to create forms from their Google Drive account so they don’t have to jump back and forth between their forms and Drive. It’s incredibly easy to get started — simply install the app as a Chrome extension, then sync your Google account with JotForm. Once it’s all set up, you’ll be able to access JotForm from Google Drive. This integration is perfect for teams that want to further streamline their workflow. Whether your team is hyper-organized or looking for an affordable way to keep track of information, Google Sheets hits the mark. That’s probably why it’s the second most used Google integration we have. Google Sheets seamlessly integrates with users’ forms, so every submission is automatically directed into a Sheet. We love using Google Sheets internally and sync it with our forms for webinar registrations. Each time someone registers for our webinar, their name, email address, and questions are all transmitted into a Google Sheet. It’s an easy way to keep track of registrants and send follow-up campaigns afterward. Google Sheets is an excellent solution for small teams on a shoestring budget because it’s inexpensive, easy to use, and gets the job done. Common use cases include using a Google Sheet to keep track of event (or webinar!) registrations, sales leads, individuals who have given consent for something (like being filmed for your company’s marketing initiatives), and more. One of the best ways to keep life in order is to use a calendar. Calendars not only help people manage their time, but they also hold us accountable for the plans we make. Looking at your calendar and following a set schedule isn’t hard. What’s hard is all of the stuff that happens before the appointment is made. No one likes long email threads and never-ending back and forth. And once you finally decide on a day and time that work, you have to manually enter the appointment onto the calendar. With our Google Calendar integration, you can easily avoid all of that hullabaloo. What’s great about our Google Calendar integration is that it takes the hassle out of scheduling. 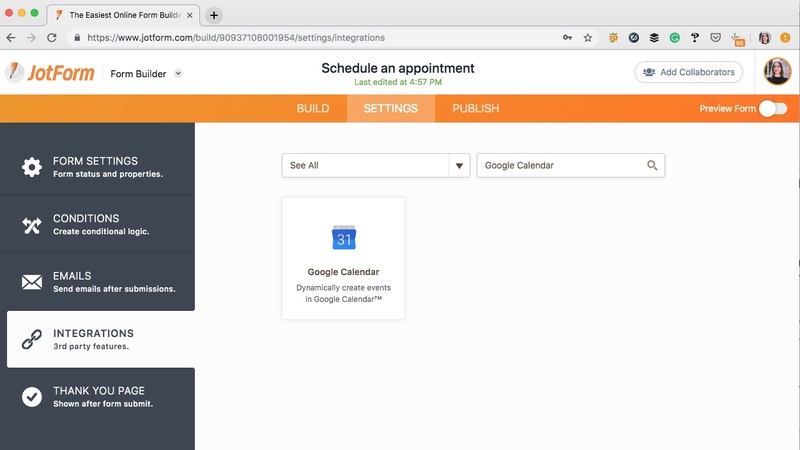 Once you connect the integration to your form, a respondent can easily choose a day and time that works with their schedule, press submit, and their appointment is automatically added to your calendar. 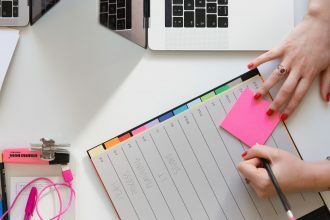 This integration is also perfect for teams that need to be part of the same event — for instance, if they’re conducting an interview together — because multiple calendars can be connected. If your organization is already taking advantage of G Suite, integrating your forms with Google Contacts is a simple way to keep your organization’s contacts in the same place as all of your other company material. Like other G Suite apps, Google Contacts is automatically backed up in your account, so there’s never a need to worry about what will happen to your data if you lose your device or it crashes. Having all of your coworker, partner, and client contact information in a single home makes outreach easy and eliminates the need to jump from one app to another. Moving your forms from Google Forms to JotForm is a seamless process. The transition is so fluid, your submission data even migrates over too. Try migrating a Google Form into your JotForm account. There are a few Google apps we didn’t mention, such as Docs and Slides. 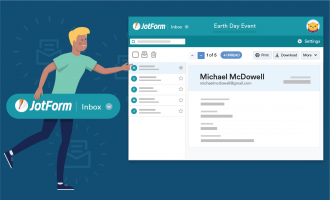 Even though JotForm doesn’t have any native integrations with them, our users can still connect their forms. 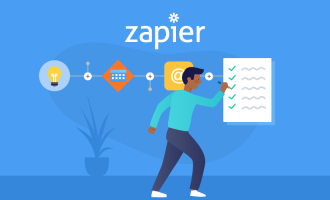 If you’d like to sync to other G Suite apps, we recommend using Zapier as a workaround. Check out their JotForm to Google Docs zap. Connecting Google integrations to your forms is pretty cool, huh? Let us know your thoughts in the comments below!